Time to Redesign Extended Producer Responsibility for a Circular Economy: New study from Zero Waste Europe. This study comes at important time for the European Commission who are currently conducting a review of waste policy and legislation. We have now released the full report which is available for download on our website. Newly released findings of a study commissioned by Zero Waste Europe1 reveal current EPR schemes are lacking in scope and effectiveness. This study provides clear evidence that Extended Producer Responsibility (EPR) schemes in Europe are insufficient. In the Executive Summary, released on Wednesday 15, July, it has been found that despite 70% of municipal solid waste being product waste, only 45% of this product waste is currently covered by an EPR scheme and only 18% of the product waste is collected with existing EPR schemes. In the full study to be released in October, there will be included a number of detailed and clear recommendations to the European Commission on improving the current EPR mechanisms and implementing truly effective EPR scheme with a broader definition which as the ‘father of extended producer responsibility’ Thomas Lindhqvist stated, would serve as “an environmental protection strategy to reach an environmental objective of a decreased total environmental impact from a product”2. 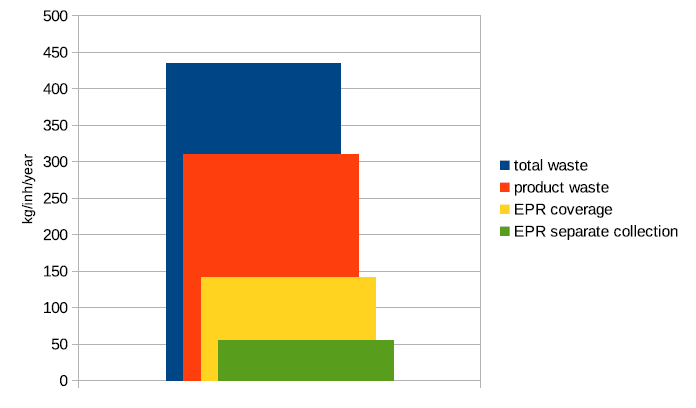 Summary of total waste, product waste, EPR coverage and EPR separate collection. For EPR thinking to fit into the circular economy, the study claims that it is necessary to connect waste managers with producers using economic instruments as well as the introduction of legally binding eco-design requirements that allow for better process and product design. This study comes at important time for the European Commission who are currently conducting a review of waste policy and legislation. The aim of which is to “help turn Europe into a circular economy, boost recycling, secure access to raw materials and create jobs and economic growth”3. All ambitious targets which will need to incorporate strong EPR protocols to have achieve the desired goals, and move Europe towards a zero waste circular economy. Joan-Marc Simon, director of Zero Waste Europe said “This study provides new evidence about the potential for improving EPR schemes in Europe and the need to use the upcoming waste package proposal to ensure that producers really take responsibility whilst providing the appropriate incentives to redesign systems and products”. It is clear that whilst EPR schemes across Europe do not manage to reach most producers there is real potential in the current review for their reform, and it is hoped that if the European Commission takes these findings into account. That would be a real step forwards for the circular economy and another step towards a zero waste Europe. 2Thomas Lindhqvist, “Mot ett förlängt producentansvar — analys av erfarenheter samt förslag” (“Towards an Extended Producer Responsibility — analysis of experiences and proposals,” in Swedish), 30 April 1992, published by the Ministry of the Environment and Natural Resources ini “Varor som faror — Underlagsrapporter” (“Products as Hazardous — background documents,” in Swedish), Ds 1992:82. The definition was published in English for the first time in: Thomas Lindhqvist, “Extended Producer Responsibility,” in the proceedings of an invitational seminar at Trolleholm Castle, 4-5 May 1992: “Extended Responsibility as a Strategy to Promote Cleaner Products,” edited by Thomas Lindhqvist, Department of Industrial Environmental Economics, Lund, June 1992. EPR in Canada has become the continuation of the “good-old-boys” waste management network. It is a closed shop, only “certain stakeholders need apply” at the design level. Why is there not a strong, very very strong No Burn component in EPR? Where there are people, there will be waste. That is a fact! The real question is: What do we do with it? It is easy to demand ‘No Burn’ but that is not a solution. The waste, once called ‘garbage’ piles up and creates harmful disease-spreading health hazards which migrate into land and water. Impoverished areas of cities everywhere experience these conditions. ‘Zero Waste’ is a less noxious way of framing the problem of ‘garbage disposal’, and ‘producer’ responsibility pushes the responsibility away from ‘us’ – the people who buy and use the goods – and onto someone else. That is not Zero Waste. Finally, everyone with an idea of what to do with waste can and should express that idea of possible resolutions to the stakeholders and everyone else for their consideration. It is often people who are closest to the problem who can most easily envision ideas, and they are the real stakeholders. Does anyone know if the absorbent material in nappies/disposable diapers is truly biodegradable in the sewage system. It’s actually sodium polyacrylate. I wrote to Kimberly-Clark but they did not really answer this question. The support plastic is a type 4 I recall. But it doesn’t seem that the manufacturer takes any responsibility for the “end-of-life” for nappies. Disposal/recycling costs should be built into the purchase price.